In better times, or perhaps I should really put in other times, I would have bi-annual work trips to Verona and in the Autumn to Tuscany. In all honesty, the latter was more like an excuse to bunk off with the boss for a few days, do a lot of driving and eat a lot of truffles. My relationship with him was easier then, and it was always, in a slightly inarticulate, awkward way a fun few days. We also tasted a lot of wine. Now for those of you who have been there, when you round the corner off Siena’s Via Banchi di Sopra and descend onto the Piazza del Campo you are launched into one the world’s most arresting views. And if you cross the Piazza, on the left just behind the Palazzo Publico is what I think Siena’s best restaurant…Le Logge (owned by the proprietor of Brunello di Montalcino Gianni Brunelli, Laura Brunelli). Now, of an evening, sous une couche d’ennuie or perhaps just to test me out, JP would always hand me the list and tell me to choose. Now it’s a big pressure point choosing the wine for Mr Big. 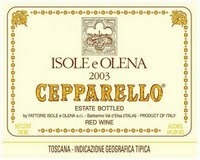 And so, all those years ago, on our first visit to Le Logge I chose a bottle of Cepparello 2001 from Isole e Olena. I had always loved the named Cepparello, so cheeky, so Tuscan, so Don Giovanni. Well, er, that’s Leparello, but you get what I mean. And I can remember that first sip even today – and JP’s gratifying remark, “Bon choix!”. Compliments were rare. It was classic pure Sangiovese with lively acidity a touch of sweetness and that sour cranberry fruit. Like the man from Remington, I loved it so much I bought the company – or at least I bought a case. And I had two bottles left. I was particularly interested because Antoni Galloni had recently put up a vertical Cepparello going back to 1980, except inevitably, the one he missed was 2001! Now 2001 was a fine vintage in Tuscany, less sun-burnt than 2000 and less washed-out than 2002. For me, it is up there with 1999, 2004, 2006 et al. But what would Ceparello give ten years on? Well, my first remark is that it needs to be decanted, and decanted a couple of hours before going to table. At first there is the searing acidity of Sangiovese and a bright, if high pitched attack on the senses. It’s more red fruit than black and tension rather than weight. As the wine opens up it fills out considerably. As a counterweight to the high pitched opening, a rather brooding lower body emerges, of meatier more consistent flavours. However, his is no beefy, portly behemoth, it is full of the mystery and promise of the forest…very Tuscan indeed. It also retains intense elegance. It has weight, poise and presence. Sophistication in an Italian sense, rather than the stiff collared, straight suited elegance of the Quai des Chartrons. I drank it over two dinners, and the wine, vacu-vinned and put in the cooler for twenty four hours did not diminish. I wish I had more, but I think I will just have to stock up on the some more recent vintages. And the next step? Well, I’ll have to have some very special guests, but I think a dinner pairing Il Carbonaione 2001 and the last Cepparello 2001 would make an interesting trail. Would Jurij’s fool blooded Florentine brow-beat the Sienese of Paolo di Marchi? Dobbiama aspettare un po’ piu tarde!